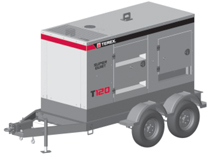 Terex® generators are a reliable choice for portable power on construction and industrial sites, at outdoor events and in emergency situations. Ruggedly durable, these generators supply power to the places you need it most. 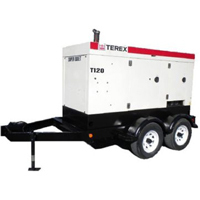 Terex® models are among the industry’s most heavy-duty generators – and with such a wide range of models, you will find the perfect fit for your needs. Quiet operation: 68 dba or less at 23 ft. (7 m). High water temperature, low oil pressure, overspeed, and overcurrent safety shutdown. Engine control module includes remote start capability on all models. Environmentally friendly, over 24 hours of fuel capacity. Designed to keep oil, antifreeze and other spills inside the unit. 3-position voltage selector switch allows unit to provide 480 and 240 volt three phase and 240 volt single phase. DOT approved and serialized trailers. Hydraulic brakes, full light package, bolt on fenders and heavy duty side-mount jacks are standard.